Iraq, the Kurds and Me: What Went Wrong in Kirkuk? Members of Iraqi federal forces gather to continue to advance in military vehicles in Kirkuk on October 16, 2017 (REUTERS/Stringer). I didn’t expect Iraq to use military force against the Kurds. And I believed, or hoped, the U.S. would step in. This article was originally published here on Salon.com on Monday, October 23, 2017. Last Sunday night, Iraqi government forces -- with the help of Popular Mobilization Units aligned with Iran -- retook the disputed city of Kirkuk. In this effort they benefited from the tacit cooperation of Kurdish military forces, known as peshmerga, who are loyal to the Patriotic Union of Kurdistan (PUK). The PUK is the historic rival of the Kurdistan Democratic Party under the leadership of Masoud Barzani, who is also the president of the Kurdistan Regional Government. The KRG, as it is known, is an autonomous region of Iraq, but many people there want much more than that. On Sept. 25, the KRG held a referendum on independence in which 93 percent of voters affirmed their desire to break away from Iraq. 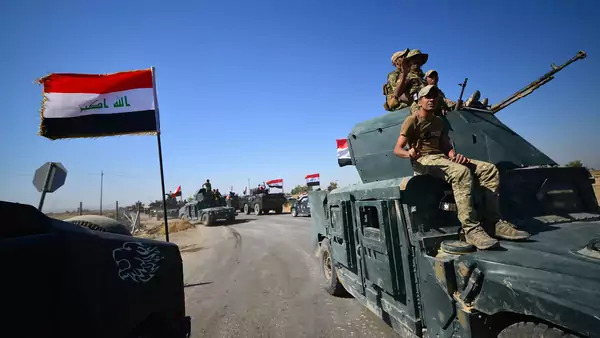 Baghdad’s military operations were part of an effort to forestall that outcome, especially since Kirkuk is not actually part of the KRG, but fell into Kurdish hands after the self-declared Islamic State overran parts of northern Iraq in June 2014 and Iraqi troops there fled. Within hours after Iraqi Prime Minister Haider al-Abadi announced the operation to secure Kirkuk, KDP-loyal peshmerga were forced to concede the city, an airbase and the oil fields in the area. It was a triumph for Abadi and an ignominious defeat for Barzani. The central government, having restored control (loosely defined), as it existed before the Islamic State’s invasion, now says it is time for negotiations between Baghdad and the Kurdish leadership in Erbil. It is unclear whether or how that can happen, with Barzani greatly weakened and Kurdish politics thrown into mutual recriminations and accusations of betrayal. On a number of levels, this was not Washington’s finest moment. It was not especially good for any number of analysts who did not expect this turn of events, particularly this one. Since I cannot speak for anyone else, I speak only for myself in stating that this is a moment of humility. I was certain that Abadi would not, and actually could not, pursue the course of military confrontation and I was convinced that his threats were posturing before a negotiation. It is now time to review and ask questions. There are some things that I got right. I knew, for example, that once Barzani called for a referendum and set a date, there was no way anyone was going to convince him to delay. To my mind, the independence referendum was a shrewd way for Barzani to resolve his domestic political problems. The KDP has been locked in a bitter battle with its rival (and partner), the PUK, as well as with an offshoot of the latter party called Gorran. The issues revolve around Barzani’s tenure as president, the KDP’s authoritarian inclinations, the problem of widespread corruption and the question of independence. Both the PUK and Gorran support independence, but have been more circumspect about it because they do not want a Kurdistan that the KDP dominates. Barzani was daring his opponents to oppose him on independence, calculating that Kurds would vote overwhelmingly to break from Iraq, and thus he could trade his domestic political troubles for a confrontation with the Iraqi, Turkish and Iranian governments, which he and his advisers believed they could handle — with the support of the United States, which has worked with and supported the KRG over many years while simultaneously emphasizing its “One Iraq” policy. I contended that the Turks could accept an independent KRG, which was incorrect. I also argued that if Ankara were to oppose the route their ally Barzani pursued — he has developed good ties with Turkish President Recep Tayyip Erdogan and his Justice and Development Party over the last decade — the Turks would have few options to prevent the referendum or any effort on the part of the Kurds to put its results into operation. This was closer to the mark. As the date of the referendum drew close, Erdogan’s rhetoric grew tougher and after the results of the vote were announced, he threatened to close the border, cut off trade (including in oil) and even invade. None of those things happened, though Turkey did participate in an air embargo of the KRG, which halted all commercial air traffic into and out of the region’s two civilian international airports. I was worried about the possibility of violence in and around Kirkuk, but who wasn’t? There is much at stake in and around the city that is wrapped up in Kurdish identity and awash in petroleum. If there was going to be violence, it was going to be in Kirkuk. That’s about all I got right. What I missed is more interesting (to me) than my good calls, especially since my job is to help policymakers and the public understand the world better. In the case of the KRG’s independence referendum and its aftermath, I did not. First and foremost, I underestimated the opposition within the PUK to Barzani’s referendum gambit. They were cool to the idea, but I reasoned that once the voting was over and the results were in, the PUK would have no option other than to support Barzani. Clearly the PUK, which had better ties with Baghdad than the KDP and refused to submit to Barzani’s power play, kept its options open with the central government and the Iranians. In 2014, I wrote a piece from Erbil arguing that the Kurds needed to fix their own politics before they could realize their dream of independence. I lost sight of that argument this time around, reasoning that Barzani had forced a fix of sorts through the referendum, which would unite Kurds in a noble cause of self-determination. Of course I know that there are different parties and factions representing a wide variety of views within Kurdish politics. Whenever any of my colleagues warned not to refer to Kurds as “the Kurds” in a monolithic way, I understood what they were saying. At the same time, I regarded Barzani and the KDP as the strongest leader and group among Iraq’s Kurds, which the referendum seemed to affirm. Clearly I confused strongest with “dominant,” because Barzani’s opponents were able to undermine him. My misinterpretation was no doubt a function of my Erbil-centric view of KRG politics. Second, although I knew that Abadi needed to look tough in the run-up to and after the KRG’s referendum, I believed that was a negotiating tactic. It was not. In retrospect, the Kurdish vote came at a terrible time for Abadi, just as he was riding a wave of good news after the collapse of the Islamic State. The apparent fait accompli that Barzani was handing him in the form of the referendum would undo much of the political goodwill and power Abadi has slowly amassed since he came to power in 2014. He would have given up all that and left himself open to rivals had he surrendered Kirkuk and other disputed territory to Barzani. As a result, he opted for force. For all the power that Abadi has accumulated, he still had a partner in Iran, the Iranian Revolutionary Guard Corps (IRGC) and militias connected to Tehran. This is not to suggest that what happened in Kirkuk was a function solely of Iranian influence in Iraqi decision-making. Abadi clearly had his own compelling motives for striking a blow at Barzani, but Iran was certainly a factor in the brief fight for Kirkuk. I had believed that Iran was a wild card and my Kurdish friends were worried about the Iranian-aligned PMU’s, but I thought the IRGC was busy and overextended and the saber-rattling was just meant intimidate Barzani in the service of negotiations. Finally, I misread American policy. This is not a function of the Trump administration, because by and large this White House has pursued a policy similar to that of its predecessor, right down to the official charged with carrying it out, Brett McGurk. There is an argument to be made that the administration’s efforts to pressure the Kurds publicly to back off the referendum was the right approach, given Washington’s commitment to Iraq’s unity. I disagree with that approach and saw it as only enabling the Iraqis and Iranians, but I also assumed that at the moment of truth Washington would, if not quite side with the Kurds, at least then restrain Baghdad. It did not make sense to me that standing aside as the Iraqis used American equipment to take down the KDP peshmerga was in American interests. It seems to me that it only fosters what policymakers are desperately trying to prevent — either Iraq’s dissolution or the further consolidation of Iranian influence in Baghdad, while at the same time alienating Barzani and the KDP. Whatever faults the KRG leadership may have, it has remained supportive of the United States in the fight against the Islamic State. In contrast, Iraq’s politicians have often proven themselves to be difficult allies given the nature of Iraqi politics and the hard fact of Iran’s role in Baghdad. Perhaps Abadi is different and has discovered a way to manage the competing demands and interests that are part of Iraq’s system of political spoils. Regardless, I had believed that the United States would avoid the mistakes of the past and, in demonstrating its own power and reliability, would help establish a better balance of political forces in Iraq. I was wrong.